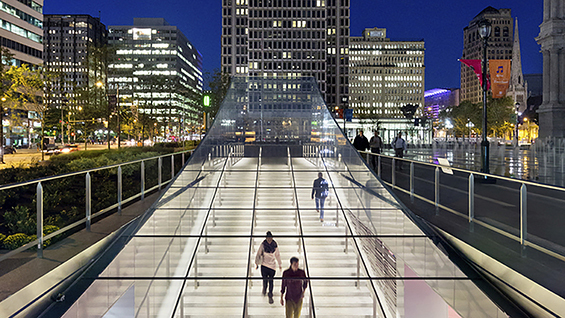 KieranTimberlake, Dilworth Plaza Renovation, Center City District, Philadelphia, Pennsylvania, 2014 © James Ewing Photography. Projects that embody the firm’s commitment to sustainability and materials research include the Melvin J. and Claire Levine Hall at the University of Pennsylvania, which employs the first actively ventilated curtainwall of its type in North America; SmartWrap™, a mass-customizable building envelope exhibited at the Cooper-Hewitt, National Design Museum, and Cellophane House™, a fully recyclable, energy-gathering dwelling exhibited at The Museum of Modern Art in New York. KieranTimberlake’s mixed-use building at 181 Mercer in New York City is currently under construction as part of New York University’s campus expansion. The firm designed the Embassy of the United States in London with the aim to significantly reduce energy consumption, set an agenda to achieve carbon neutrality, as well as contribute to the current revitalization of South Bank’s industrial zone through the creation of a civic plaza and park. KieranTimberlake received the AIA Firm Award in 2008 and the Cooper-Hewitt National Design Award in 2010. The Embassy of the United States in London was the recipient of London’s Centre for the Built Environment New London Architecture Award in 2017. Stephen Kieran and James Timberlake currently teach at University of Pennsylvania School of Design and taught previously at the University of Washington and the University of Texas at Austin respectively. They have also held visiting professorships at Yale University, the University of Michigan, and Princeton University. James Timberlake was appointed by the Obama Administration to serve on the Board of the National Institute of Building Sciences in 2012. Marion Weiss is cofounder of WEISS/MANFREDI Architecture/Landscape/Urbanism, based in New York City and the Graham Chair Professor of Architecture at the University of Pennsylvania.